Knit rows 1 - 6 until piece measures roughly 20" for size small, and 21" for size large when stretched very lightly, and you've just finished row 5 of the pattern (if your gauge works out like mine then you'll probably repeat the pattern 20 times for the small, and 21 for the large). Transfer your held provisional stitches to a dpn and use the Kitchener stitch to seam the ends of the band together. Now that your band is joined, it's time to finish the rest of the hat! With that in mind, then, pick up 76 (80) stitches evenly along one edge of the band (put whichever side looks prettiest towards the bottom), place marker, and join in round. Knit in stockinette until hat measures between 7" and 8" in total (depending on desired slouch and size - mine measures 8"). Then, we'll begin the decreases as follows. Notice that the first row will be different for the two sizes, but will then be the same for the rest of the decrease. Super cute as usual. Thanks so much! Thank you! Let me tell you, the struggle was real with this one. I thought this yarn would be super easy to work with and got a great idea immediately, and then the whole thing went to you-know-what. And it didn't help that my 2 year-old stole one of the balls and ripped it into about 8 separate pieces!!! and now it looks stunning! Thank you! Can't wait to give this a go! Great! Let me know if you have any questions!!! 2 adult sizes, but Size measurement? My head is big & I hate making something & having it be too small. Same goes for sewn clothing. Love the style & need a hat, even in FL sometimes! 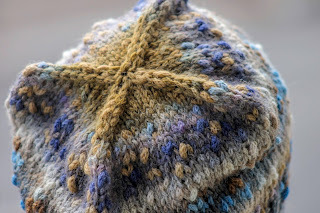 I like those pesky bulkier stitches! I think they make the fabric interesting. Thank you for sharing this. I think I'll give it a go. What weight is the nightmare yarn? 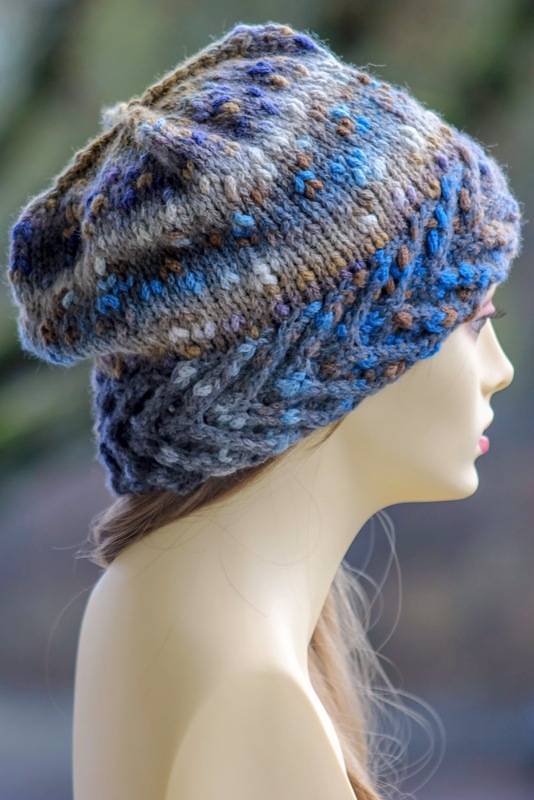 Love this hat and am interested in making it with a different yarn. It's bulky weight. :) And, just for future reference, I tag all of my posts with the yarn weight (you can find those labels below the last picture, but above the comments). Nightmare or not, it turned out beautifully. Just a question, can this be knit flat and then seamed? I absolutely hate kniting in thround! Using your US 10 needles, cast on 18 stitches. Then we'll work the cabled bottom edge of the hat as you'll find below. To do this, you'll need the following notation. Knit rows 1 - 6 until piece measures roughly 20.5" for size small, and 21.5" for size large when stretched very lightly, and you've just finished row 5 of the pattern. Bind off loosely. 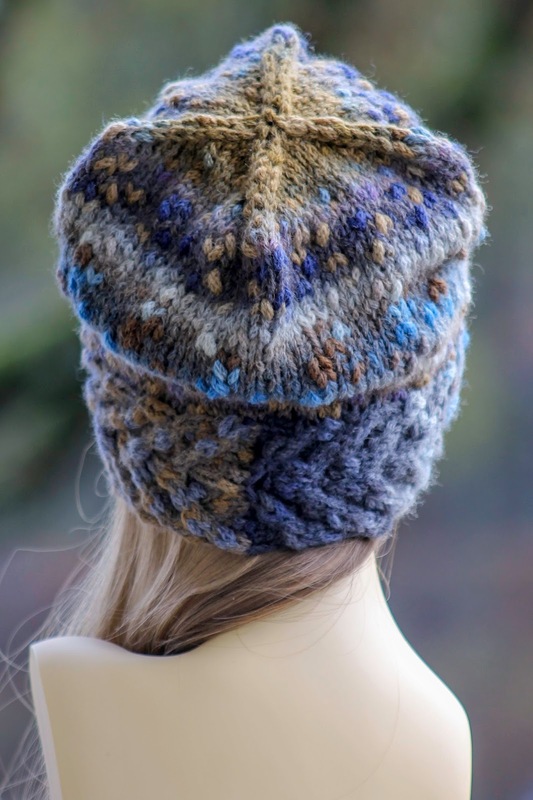 Now that your band is done, it's time to finish the rest of the hat! With that in mind, then, pick up 78 (82) stitches evenly along one edge of the band (put whichever side looks prettiest towards the bottom). 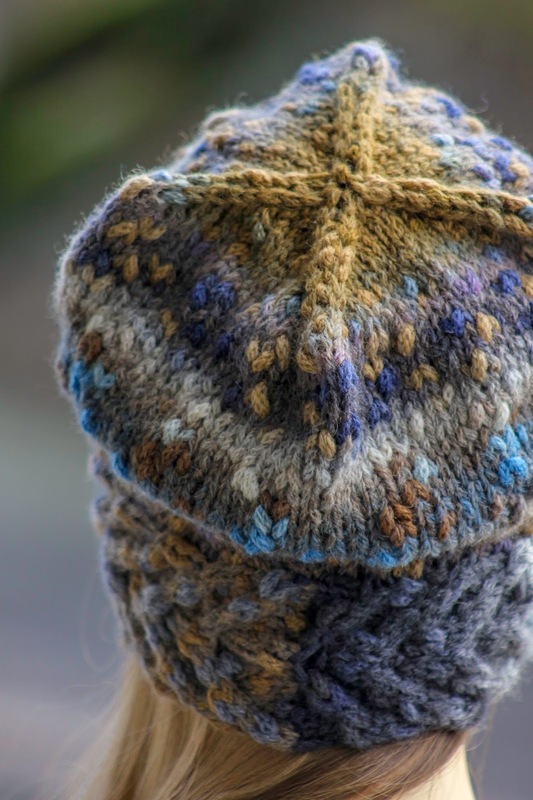 Knit in stockinette until hat measures between 7" and 8" in total and you’ve just finished a wrong side row (depending on desired slouch and size - mine measures 8"). Then, we'll begin the decreases as follows. Notice that the first row will be different for the two sizes, but will then be the same for the rest of the decrease. Complete decrease rows 1 - 9. Then, transfer final 10 stitches to a piece of scrap yarn to hold for later. 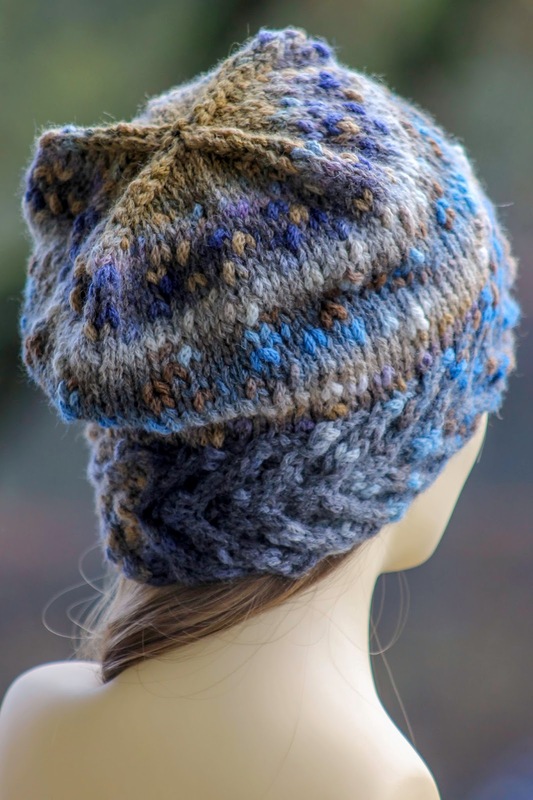 Beginning at the bottom edge of the hat, seam until you reach final 10 stitches. 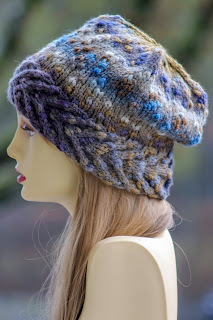 Pull seaming thread through final 10 stitches, pull tight, and thread to inside of hat. Knot and tuck in ends. Thank you thank you thank you for converting this to straight needles. I hate DPNs and now I can truly enjoy making my hat! I have a lovely mohair and metallic thread yarn I picked up at a local yarn fest and can’t wait to see the finished product! You are very welcome!!! And that sounds like the PERFECT nightmare yarn!!!!! I really enjoyed this "nightmare" and it's wonderfully comfortable to wear! 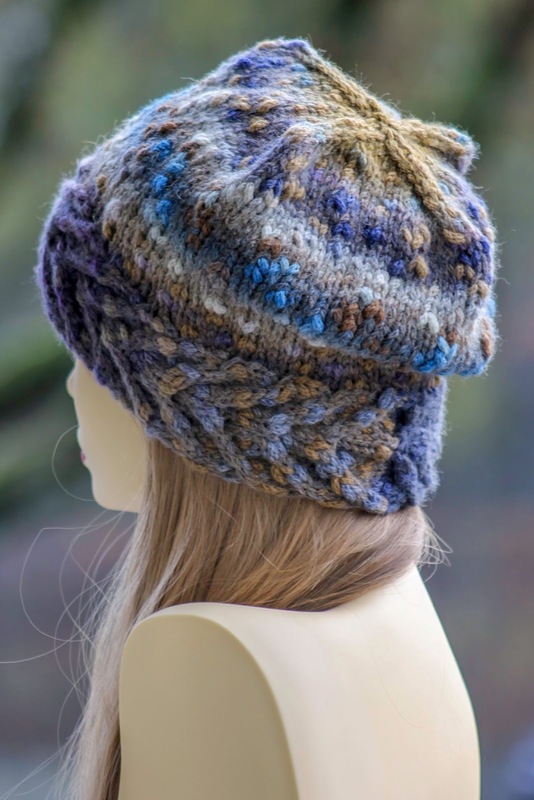 I used Paton's Shetland Chunky which I enjoy working with, so it was more of a dream. 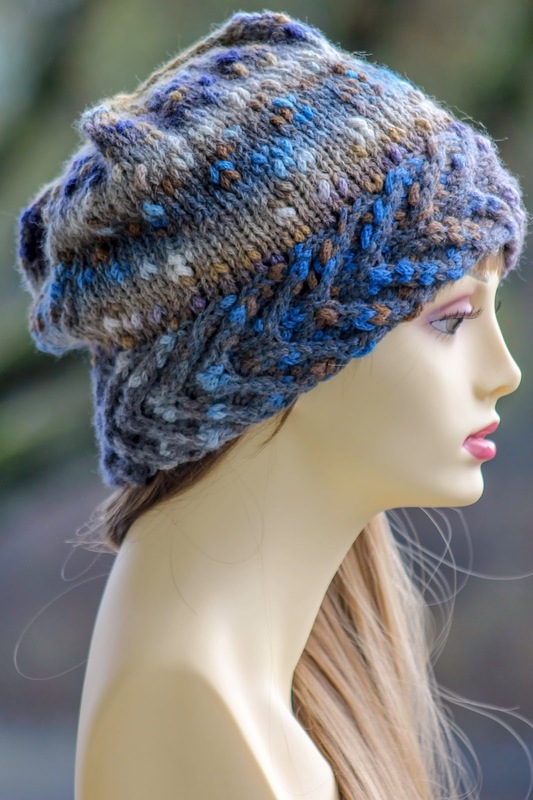 It is the third of your headgear patterns I've worked, and they're really my favourites. I think I must have a big head because I made the larger size and it's a perfect fit--it doesn't ride up or slide down. I've found with headbands I've knit that if it becomes too stretchy and loose, just crocheting an iCord edging will limit the stretch well enough. But this slouchy cabled band has a lovely smooth scalloped edge, so I like it as is. I'm tempted to make another!